Please consider making a donation on #GivingTuesday, November 27th, 2018! Click here to donate to the Dustin Smith Heart Foundation. A donation to the Dustin Smith Heart Foundation (DSHF) will go towards raising awareness of Hypertrophic Cardiomyopathy and towards research to understand HCM and how to prevent sudden cardiac death from HCM. This holiday season please consider donating to DSHF. Please consider making a donation on #GivingTuesday, November 29th! Today is #GivingTuesday please consider making a donation to the Dustin Smith Heart Foundation. Thank you to everyone who has previously donated to the Dustin Smith Heart Foundation. Every donation helps. A Big Thank You to everyone that attended our September 16th Kick-off Event at the Boat Basin in New York City. We had over 50 attendees and raised over $2,000 after all costs. As of November 20, 2005 personal donations along with our first fundraiser has brought in over $4,000! On a sad note, it was recently announced that You Tube star, Caleb Bratayley passed away at the young age of 13 from Hypertrophic Cardiomyopathy, HCM. Without speaking to Caleb’s family members (we reached out through comments on the family’s Facebook account, but we are having trouble finding contact information) we do not know if Caleb was screened with an echo-cardiogram prior to his unexpected passing. By raising awareness of HCM, we hope that anyone who has a family history of HCM or of sudden cardiac death under the age of 40, or anyone who has symptoms of HCM is able to receive an echo-cardiogram. Dustin Smith Heart Foundation Kick-off Party! In Memory of Dustin Arthur Smith. 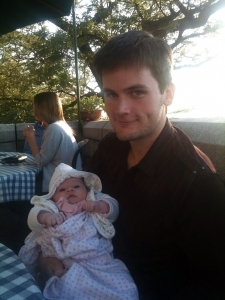 Photo of Dustin and his niece Brooke, August 2011 at the Boat Basin.